That's a mighty clever title, no? I had a lot of fun reading your guesses about my playlist. Thanks everyone for playing along! Before the race I updated my playlist and added several songs. Some were old school like ABBA and The Cars, some were heavier like Van Halen's Running with the Devil and a new favorite from Beyonce, Single Ladies (Put a Ring on It). One of the best ones I moved up to the front is Get'cha Head in the Game from, yes, High School Musical. It's saccharine peppiness perks my feet right up. Sincerely Anna pegged it right away with her guess of New Year's Day by U2. Be checking your mailbox for a bit of good mail on its way to you. Soon. Ish. My legs have been a little sore these last few days which has served to remind me I need to stretch more regularly and use my foam roller. Foam rolling helps as a form of self-massage to work out tightness and sore spots. Professional sport massages are wonderful, but can be expensive to schedule regularly. 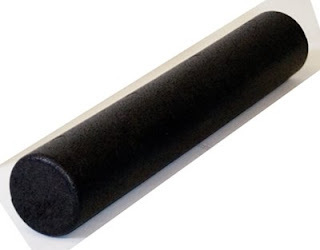 A high-density foam roller can help fill in the gaps between appointments and maybe even save you some money. In my last running post I mentioned taking an ice bath which aids in muscle recovery after longer runs. I think the key is to take your ice bath as close to the end of your run as you can, the sooner the better. Everyone has his or her way that works best for them, I have finally figured out what works for me. On your way home from your long run or race stop by the convenience store and buy two bags of ice (last week I only used what was in our ice maker, it was okay but not quite enough). Start filling your tub with cold water with the sealed bags of ice in there as well. You only need enough water to cover your legs. Grab a big mug of hot coffee or cocoa and climb on in. Once you are in, open the bags of ice and try to sit at least 10-15 minutes. It's terribly shocking at first, but works miracles on sore muscles. What new songs are playing in your ears? Do you use a foam roller or take an ice bath? What muscle remedy works best for you? It could be the ice bath (oh, and well, sheer laziness) that has kept me from becoming a runner. It sounds nothing short of torturous! But, I believe you that it works wonders -- it better! I like the stick. The ice baths I am terrible to committing to them I must I must get into them regulary. PS a sweet bribe with the hubby gets me a great roll out. when I took my ice bath last week, I had a towel wrapped around my shoulders. It helped...some!